We thought we could change the world. We know now that that feeling was not unique to us, that every revolutionary moment courses with the pulse of a manifest destiny. How different things feel today. I will not bury our convictions, but that feeling – youthful optimism? naiveté? idealism? foolishness? – is now truly and irrevocably dead. By the time I return from America the army had cleared two sit-ins, begun court-martialing civilians en masse and assaulting women protestors with virginity tests. The revolution now is smaller, but serious, focused and under sustained attack. The un-fallen state, the deep state, the client state; once a month, every month, it attacks. It clears Tahrir in March, April, August and December. It attacks protestors at the Israeli Embassy. It envelopes downtown Cairo in a November mist of Pennsylvanian tear gas. It rains down rocks and Molotov cocktails from the roof of the Cabinet building. It welds shut the doors of the Port Said stadium deathtrap. Every month, people die fighting it. In November 2011 and in January 2012 the streets echoed with chants demanding the end of military rule. But now it had become the self-appointed role of the politicians to translate street action into political gain. Now, the army had people to talk to. Had all the forces that were supposedly against the military – the revolutionaries, the liberals, the Brotherhood and the Salafis – ever truly united where might we have been today? Dead, possibly. But maybe not. Maybe somewhere closer to a civilian state. A real, ideological alliance was never possible. But a tactical, practical one might just have worked. But rather than work together each party repeatedly met with and made deals with the army, consistently placing the generals in the strongest tactical position. Everyone was to blame. The old, moneyed liberals who presented themselves as allied with the revolution lived in relative comfort, had historical ties to the army and routinely demonized the Brotherhood. The revolutionaries’ disdain for high politics meant that they effectively removed themselves from the equation. The Salafis were only ever interested in the deal that brought them the most power and their prized ministries – education and health. And the Brotherhood, long-enamored of their ability to put numbers on the street, was arrogant and duplicitous from the beginning – making serious electoral promises to the liberals, lobbying America and offering the army immunity and oversight of itself. When in power, Mohamed Morsi refused to take on the Ministry of Interior. Instead, he appointed Ahmad Gamal al-Din who, as chief of the Assiut Security Directorate almost killed off the revolution there in January 2011 and then was the Supreme Council of the Armed Forces’ chief of General Security at the time of the Moahmed Mahmoud and the ultras massacres. The main enemy of the people has always been the security state – the police and the army. We will never get anywhere until they are dismantled entirely. There was a moment when that could have been achieved, when a civilian state could have been built. But Morsi and the Muslim Brotherhood would have had to choose the challenge of working with the disparate and bickering forces of the left and the liberals over dealing with the organized certainty of the military. Here we are on July 11th 1995, in Serbian Srebrenica, just before a great Serb holy day. We give this town to the Serb nation; in memory of the uprising against the Turks. The time has now come to take revenge on the Muslims. It’s June 27, 2013. We’re sitting in Estoril, at the corner table under the television. Of the six of us, three genuinely believe that the marches on June 30 will be very seriously attacked; that it is the perfect moment for the old National Democratic Party networks to throw the country into chaos, and so force the army to take control again. There is talk of kill lists. I spend hundreds of pounds on goggles I hope will keep the birdshot out of our eyes. I don’t want to march that day. I want Morsi gone, but the voices we are hearing are all feloul, and online instructions are circulating insisting no one chant against the army or the police. But all my friends are going, so what choice do I have? To watch them die on television? And on July 3, just as they did on February 11, 2011, the army staged a coup. In February they removed Mubarak to sap public pressure and demobilize people. And it worked. What happened this time? Did the street pressure force the army to act, or did the army create the street pressure through Tamarod to get what they wanted? 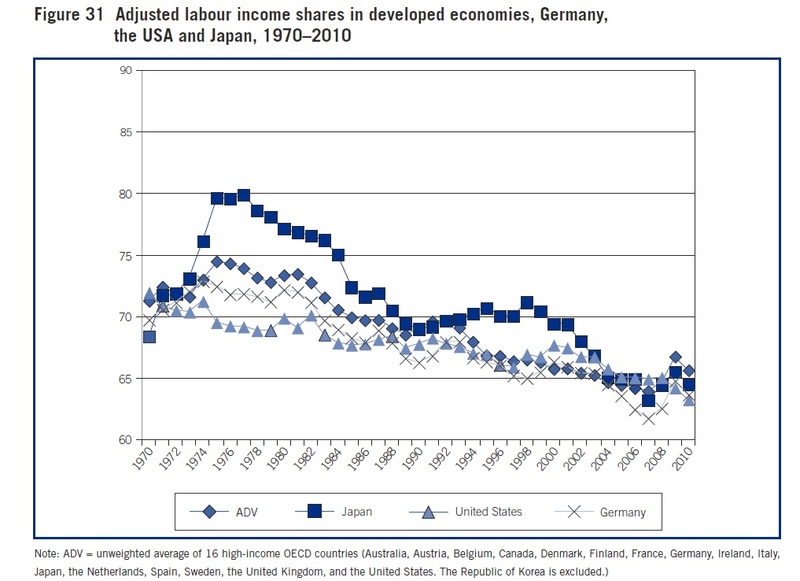 Here’s the labor share of income in the U.S., Germany, and Japan. For example, the U.S labor share of income (shown by the triangles) hover around 68-70% of GDP through the 1970s, and even by the mid-1980s is near the bottom end of this range, but has declined since. Here’s a figure showing patterns for several groups of emerging and developing economies. The longest time series, shown by the darker blue diamonds, is an average for Mexico, South Korea, and Turkey. One of the results of the declining labor share of the economy is that as productivity growth increases the size of economies, the amount going to labor is not keeping up. Here’s a figure showing the divergence in output and labor income that has opened up since 1999 for developed economies. 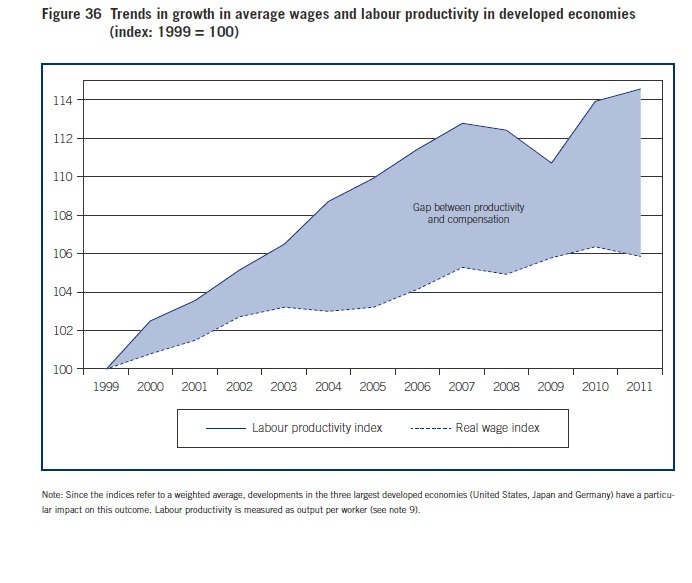 The results here are weighted by the size of the economy, so the graph largely reflects the experience of the three biggest developed economies: the U.S., Japan, and Germany. 1) When a trend cuts across so many countries, it seems likely that the cause is something cutting across all countries, too. Looking for a “cause” based on some policy of Republicans or Democrats in the U.S. almost certainly misses the point. 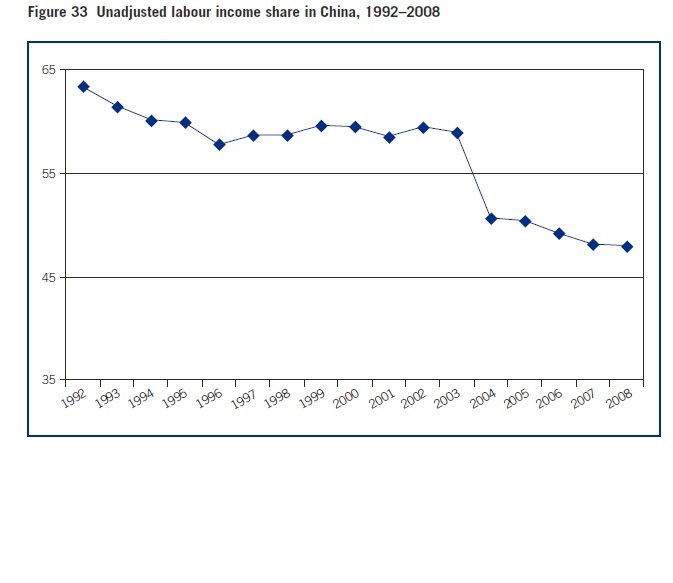 The same is true of looking for a “cause” based in policies more common in Europe, or in China. 2) The causes are still murky, but one possible answer can be pretty much ruled out. The declining labor share is not caused by a shift from labor-intensive to more capital-intensive industries–because the trend toward a lower labor share is happening across all industries. The difficulty is that the other possible explanations are interrelated and hard to disentangle. They include technological change, globalization, the rise of financial markets, altered labor market institutions , and a decline in the bargaining power of labor. But after all, technological changes in information and communication technology are part of what has fed globalization, as well as part of what led to a rise of the financial sector. Globalization is part of what has reduced the bargaining power of labor.The ILO report offers some evidence that the rise of the financial sector is a substantial part of the answer. Here’s a post from a couple of weeks ago on the growth of the U.S. financial sector. 4) While understanding causes is useful, policies don’t always have to address root causes. When someone is hit by a car, you can’t reverse the cause, but you can still address the consequences. 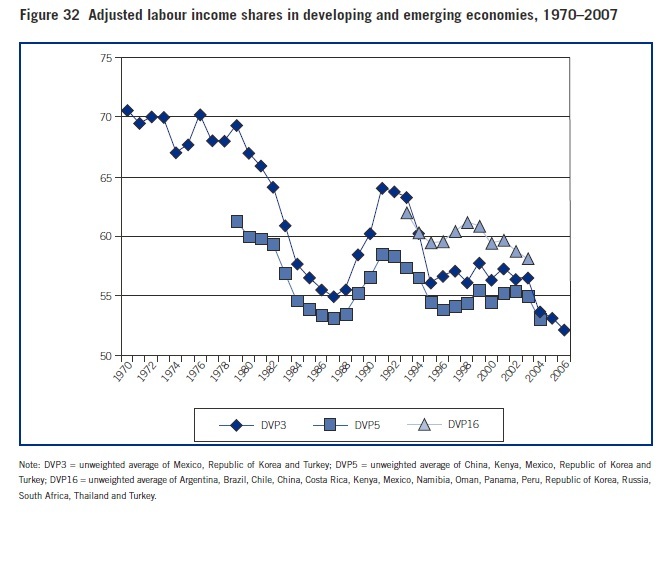 However, it’s worth remembering that the falling share of labor income has been happening all over the world, in countries with a very wide range of different policies and economic institutions. For example, European labor market institutions are often thought of as being more worker-friendly, but they haven’t prevented a fall in the labor share of income. 5) It’s important to remember that the falling share of labor income is different from a rising level of wage inequality. The share of income going to labor as a whole is falling, and also a greater share of labor income is going to those at the highest levels of income. Both trends mean that those with lower- and middle-incomes are having a tougher time. will presumably level out at some point: will it return? or not? Albert Edwards, the famously bearish strategist at Societe Generale, has a new note that goes to town on U.K. chancellor George Osborne, who, as part of his budget plan unveiled in March, proposed that the U.K. get more involved in subsidizing mortgages. Edwards has decided that he can no longer keep his mouth shut on the matter, and must lash out at this horribly misguided policy. He goes on to express the viewpoint that house prices are already way too high. 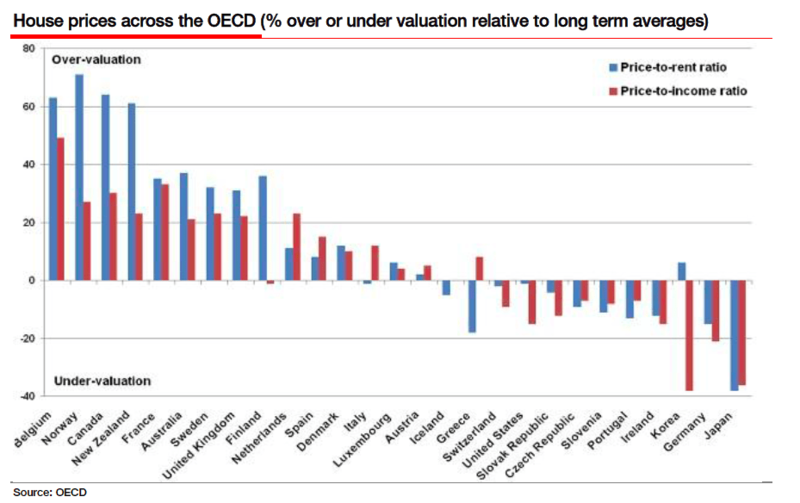 He points to this chart, showing how high U.K. prices are relative to other countries. What makes me genuinely really angry is that burdening our children with more debt (on top of their student loans) to buy ridiculously expensive houses is seen as a solution to the problem of excessively expensive housing. I would have thought the lack of purchasing power should contribute to house prices declining or stagnating (relative to incomes), hence becoming affordable once again. You would have thought that George Osborne would be ideologically predisposed to a market solution, wouldn’t you? But apparently not. Why are houses too expensive in the UK? Too much debt. So what is George Osborne’s solution for first time buyers unable to afford housing? Why, arrange for a government guaranteed scheme to burden our young people with even more debt! Why don’t we call this policy by the name it really is, namely the indentured servitude of our young people. Tens of thousands of workers who were denied the minimum wage have received hundreds of pounds in back pay from their employers following tougher enforcement policy by tax inspectors. Over the last year more than 26,000 workers were paid back £4m after action by HM Revenue and Customs, who are responsible for enforcing minimum wage laws. Some of the 1,693 complaints against employers for allegedly breaching minimum pay rules resulted in some of the UK’s largest employers being forced to repay hundreds of thousands of pounds. A national retailer, which required its employees attend work before and after opening hours without pay, was ordered to pay arrears of wages of more than £193,000 for nearly 3,500 workers. A multi-outlet retailer was ordered to repay almost £170,000 for more than 6,000 workers after requiring employees to purchase specific items of clothing from its shops, and a major fashion chain was ordered to pay its 90 unpaid interns almost £60,000. Last year the Guardian revealed how theArcadia group who run Miss Selfridge and Topshop stores, had been forced to hand retrospective payments worth hundreds of pounds to dozens of its former unpaid interns. Under the national minimum wage, which stands at £6.19 an hour for workers aged 21 and over, it is unlawful for organisations not to pay anyone who could be classified as a worker. HMRC said on top of forcing wage payments, they had issued fines to 708 employers with 51 receiving the maximum penalty of £5,000. Employment minister Jo Swinson, who has been driving some of tougher policies said: “Paying less than the minimum wage is totally unacceptable. Whenever we find examples of businesses breaking the law we will crack down on them. “Supporting fairness in the workplace is one of our key priorities and the national minimum wage is one way of making sure this happens. HMRC revealed that between 2012-13 a total of 17,775 people called the government’s Pay and Work Rights Helpline for advice or to report an illegal wage which, led to 1,408 investigations into employers. Currently calls to the helpline from interns, who are working for nothing or for “expenses only”, are being fast-tracked to HMRC enforcement officers for investigation. I am a former soldier. I completed one tour of duty in Afghanistan, refused on legal and moral grounds to serve a second tour, and spent five months in a military prison as a result. When the news about the attack in Woolwich broke, by pure coincidence Ross Caputi was crashing on my sofa. Ross is a soft-spoken ex-US marine turned film-maker who served in Iraq and witnessed the pillaging and irradiation of Falluja. He is also a native of Boston, the scene of a recent homegrown terror attack. Together, we watched the news, and right away we were certain that what we were seeing was informed by the misguided military adventures in which we had taken part. So at the very outset, and before the rising tide of prejudice and pseudo-patriotism fully encloses us, let us be clear: while nothing can justify the savage killing in Woolwich yesterday of a man since confirmed to have been a serving British soldier, it should not be hard to explain why the murder happened. These awful events cannot be explained in the almost Texan terms of Colonel Richard Kemp, who served as commander of British forces in Afghanistan in 2001. He tweeted on last night that they were “not about Iraq or Afghanistan”, but were an attack on “our way of life”. Plenty of others are saying the same. But let’s start by examining what emerged from the mouths of the assailants themselves. In an accent that was pure London, according to one of the courageous women who intervened at the scene, one alleged killer claimed he was “… fed up with people killing Muslims in Afghanistan …”. It is unclear whether it was the same man, or his alleged co-assailant, who said “… bring our [Note: our] troops home so we can all live in peace”. It is equally important to point out, however, that rejection of and opposition to the toxic wars that informed yesterday’s attacks is by no means a “Muslim” trait. Vast swaths of the British population also stand in opposition to these wars, including many veterans of the wars like myself and Ross, as well as serving soldiers I speak to who cannot be named here for fear of persecution. Yet this anti-war view, so widely held and strongly felt, finds no expression in a parliament for whom the merest whiff of boot polish or military jargon causes a fit of “Tommy this, Tommy that …” jingoism. The fact is, there are two majority views in this country: one in the political body that says war, war and more war; and one in the population which says it’s had enough of giving up its sons and daughter abroad and now, again, at home. For 12 years British Muslims have been set upon, pilloried and alienated by successive governments and by the media for things that they did not do. We must say clearly that the alleged actions of these two men are theirs alone, regardless of being informed by the wars, and we should not descend into yet another round of collective responsibility peddling. Indeed, if there is collective responsibility for the killings, it belongs to the hawks whose policies have caused bloodbaths – directly, as in Afghanistan and Iraq, and indirectly in places as far apart as Woolwich and Boston, which in turn have created political space for the far right to peddle their hatred, as we saw in the immediate aftermath of the Woolwich attack. What we must do now is straightforward enough. Our own responsibilities are first of all to make sure innocents are not subject to blanket punishment for things that they did not do, and to force our government – safe in their houses – to put an end to Britain’s involvement in the vicious foreign occupations that have again created bloodshed in London.